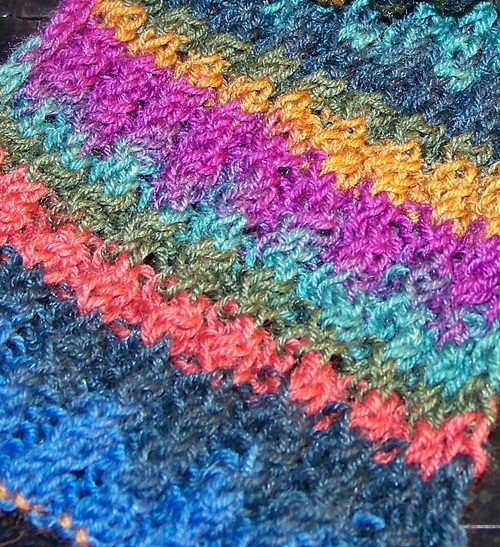 I want to share with you an easy rib scarf pattern. Thanks go out to my friend, Jude in New Zealand for sharing it with her American friends. 1 skein will make a scarf approximately 36 inches x 5 inches. 2 skeins will double the length. 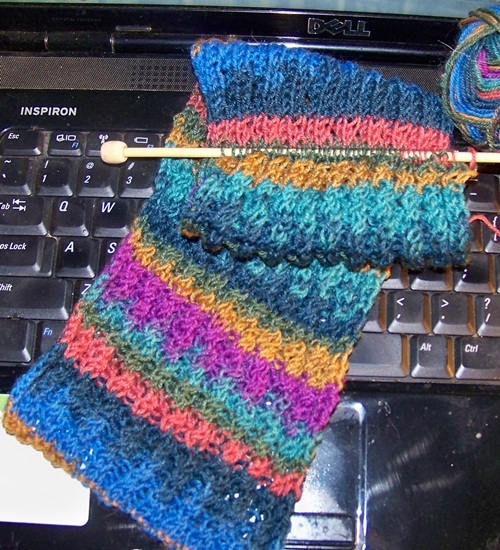 Row 3: K2, P2, *YO (bring yarn to back, then over right hand needle & to back of work), K2tog, P2*. Repeat from * to * to last 2 stitches, K2. Row 5: K2, P2, *K2tog, YO (bring yarn to front, then over right hand needle & back to front of work), P2*, Repeat from * to * to last 2 stitches, K2. Row 6: P2, K2 to end, finishing with P2. Repeat Rows 3 thru 6 … forever or until you run out of yarn. BO and weave in all loose ends. This entry was posted in knitting and tagged Bind off, BO, cast on, CO, easy, gauge, K2, knit, New Zealand, P2, purl, rib, scarf, sock yarn, yarn over, YO. Bookmark the permalink. ← What Would I do IF I Won the Lottery, PowerBall, etc. This is beautiful. I really like those colors. Thanks, Barb. That’s just Regia sock yarn. It’s a little darker than shown here. Although I’m following the pattern, I feel like I’m doing it wrong. If you are following the pattern as written you are doing it correctly.